VALLEJO, Calif.--(BUSINESS WIRE)--Six Flags Discovery Kingdom, the Thrill Capital of Northern California, in partnership with Warner Bros. Consumer Products, on behalf of DC, today announced DC UNIVERSE, an exciting, newly themed section of the park where guests will find themselves immersed inside a DC comic book-inspired world. This themed section will feature the park’s most innovative roller coaster to date, BATMAN: The Ride—Northern California’s first 4D free fly roller coaster—and the newly reimagined THE FLASH: Vertical Velocity, a high-speed launch coaster. 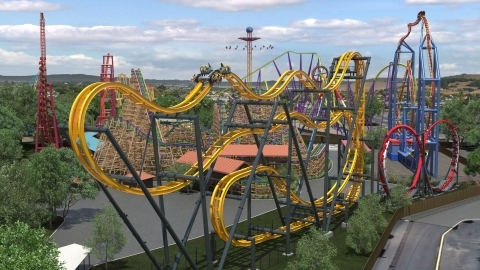 These two thrill machines join forces in DC UNIVERSE with an incredible lineup of existing branded attractions including: WONDER WOMAN Lasso of Truth, SUPERMAN Ultimate Flight, and the rogues’ gallery of Super-Villain-themed attractions—THE JOKER, HARLEY QUINN Crazy Coaster, and THE PENGUIN Ride. A 120-foot-tall, 90-degree vertical lift hill and two beyond 90-degree “raven” drops giving the sensation of freefalling. Also debuting in 2019, a guest favorite thrill ride experienced in an exhilarating, new way—THE FLASH: Vertical Velocity. Featuring new thematic elements, this spiraling, suspended coaster uses an advanced electromagnet propulsion system to shoot riders from 0-60 through a myriad of exhilarating movements including fast straightaways, corkscrew inversions and up a 150-foot-tall vertical tower. The DC UNIVERSE themed area will also offer a host of new food, shopping and entertainment options. Guests can satisfy their inner super hero or super-villain at The Daily Planet, THE JOKER Funhouse Shop, or the new Batman-themed retail store. For those super appetites, Quick Quenchers Refill Station, and Big Belly Burger, featuring mobile ordering, will be ready with hot, delicious food and icy cold beverages. Members of the Justice League will also be on hand for meet-and-greet and photo ops throughout the day. Six Flags Discovery Kingdom features more than 30 rides and attractions, including unique, up close and interactive animal experiences. For more information, visit: sixflags.com/discoverykingdom. Six Flags 2019 Memberships and Season Passes are currently on sale. Members can now enjoy priority park entry, preferred parking and tremendous discounts of up to 50% on nearly all food and merchandise purchases all season long. Gold Plus, Platinum, Diamond and Diamond Elite levels are available featuring all the perks of a Season Pass plus other benefits including admission to all Six Flags branded theme and waterparks, skip the line passes, unlimited soft drinks and much more! For more information, visit the Membership Sales Center or go online to sixflags.com/discoverykingdom and sign up. Six Flags Entertainment Corporation is the world’s largest regional theme park company and the largest operator of waterparks in North America, with $1.5 billion in revenue and 26 parks across the United States, Mexico and Canada. For 58 years, Six Flags has entertained millions of families with world-class coasters, themed rides, thrilling water parks and unique attractions. 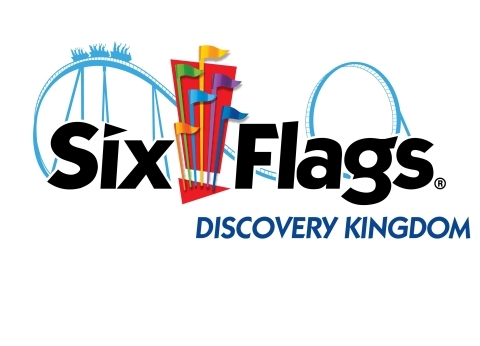 For more information, visit www.sixflags.com. Warner Bros. Consumer Products (WBCP), a Warner Bros. Entertainment Company, extends the Studio’s powerful portfolio of entertainment brands and franchises into the lives of fans around the world. WBCP partners with best-in-class licensees globally on an award-winning range of toys, fashion, home décor, and publishing inspired by franchises and properties such as DC, J.K. Rowling’s Wizarding World, Looney Tunes and Hanna-Barbera. The division’s successful global themed entertainment business includes groundbreaking experiences such as The Wizarding World of Harry Potter and Warner Bros. World Abu Dhabi. With innovative global licensing and merchandising programs, retail initiatives, promotional partnerships and themed experiences, WBCP is one of the leading licensing and retail merchandising organizations in the world. 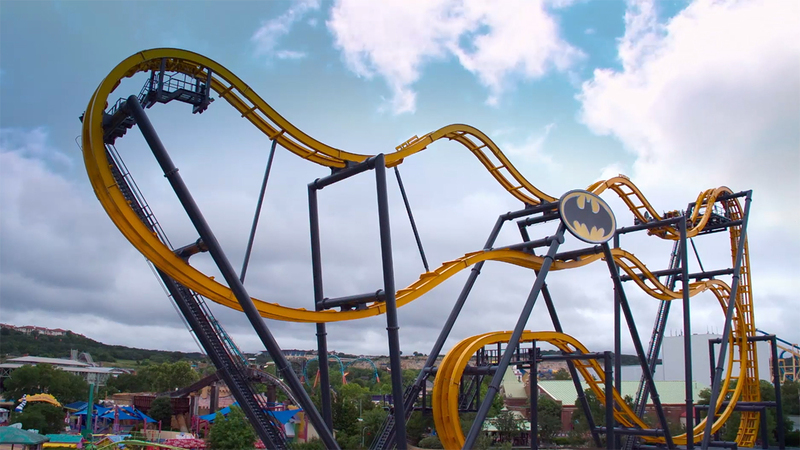 Six Flags Discovery Kingdom announces new DC Universe themed area featuring Northern California's first 4D free fly roller coaster, BATMAN: The Ride.